A balance sheet is a statement of the financial position of a business which states the assets, liabilities and owner's equity at a particular point in time. In other words, the balance sheet illustrates your business's net worth. The balance sheet may also have details from previous years so you can do a back-to-back comparison of two consecutive years. This data will help you track your performance, and will identify ways in which you can build up your finances and see where you need to improve. You can also use the balance sheet to determine how to meet your financial obligations and figure out the best ways in which you can use credit to finance your operations. The Income Statement which shows net income for a specific period of time, such as a month, quarter, or year. Net income equals revenue minus expenses for the period. The Cash Flow Statement which shows the movements of cash and cash equivalents in and out of the business. Chronic negative cash flows are symptomatic of troubled businesses. Incorporated businesses are required to include balance sheets, income statements, and cash flow statements in financial reports to shareholders and tax and regulatory authorities. Preparing balance sheets is optional for sole proprietorships and partnerships, but is useful for monitoring the health of the business. An up-to-date and accurate balance sheet is essential for a business owner looking for additional debt or equity financing, or who wishes to sell the business and needs to determine its net worth. As in the balance sheet example shown below, assets are typically organized into liquid assets — those that are cash or can be easily converted into cash, and non-liquid assets that cannot quickly be converted to cash such as land, buildings, and equipment. Long-term liabilities are any that are due after a one-year period. These may include deferred tax liabilities, any long-term debt such as interest and principal on bonds, and any pension fund liabilities. Equity, also known as shareholders' equity, is that which remains after subtracting the liabilities from the assets. Retained earnings are earnings retained by the corporation — that is, not paid to shareholders in the form of dividends. Retained earnings are used to pay down debt or are otherwise reinvested in the business to take advantage of growth opportunities. While a business is in a growth phase, retained earnings are typically used to fund expansion rather than paid out as dividends to shareholders. Should I Do the Balance Sheet for My Business? For a startup business, it is a good idea to have an accountant do your first balance sheet — particularly if you are new to business accounting. A few hundred dollars of an accountant's time may pay for itself by avoiding issues with the tax authorities. You may also want to go over the balance sheet with your accountant after any major changes to your business. 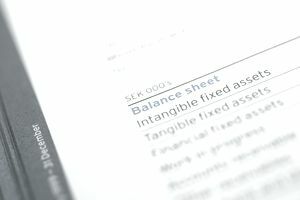 Balance sheets are easy to do if you use accounting software. Accounting software designed for small businesses can keep track of all your accounting information and generate balance sheets, cash flow statements, and other reports automatically as needed. Also Known As: Statement of financial position.